Turn your character into Ryu or Sakura. 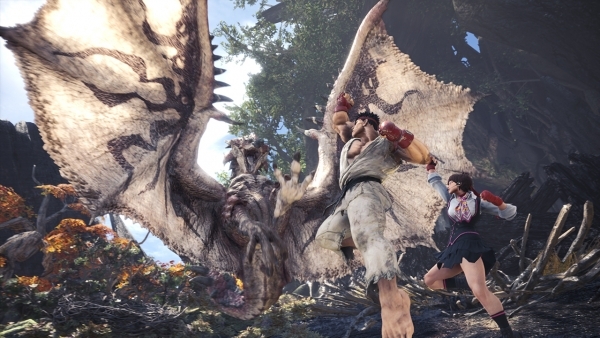 Capcom has announced a Street Fighter V: Arcade Edition collaboration event for Monster Hunter: World that will grant players full sets of armor that turn their characters into Ryu or Sakura. In just a few weeks, we’ll be featuring the quest to get Ryu’s set as an exclusive early opportunity to PlayStation 4 players that also have a save data file from Street Fighter V (including Street Fighter V: Arcade Edition). Hunters with that save data will receive a special quest called “Down the Dark, Muddy Path.” Just channel your fighting spirit, complete that quest and you’ll get “Street Fighter V Tickets” as the special reward item. Bring that, along with other necessary materials, to the Smithy and you got yourself a Ryu armor set! Hunters on PlayStation 4 that don’t have Street Fighter V save data (and hunters on Xbox One) won’t have to wait much longer, however, as the Event Quest will go back in rotation for all players at a later date. The exact timing is still to be announced, but during this time, everyone will be able to fight for their Ryu set. And not long after that, two new Event Quests will be added to the rotation for all players (PlayStation 4 and Xbox One) and completing them will get you new “Street Fighter V Tickets,” so you can craft the Ryu and Sakura sets. Monster Hunter: World is available now for PlayStation 4 and Xbox One, and will launch for PC this fall. In Japan, it is only available for PlayStation 4. Watch the collaboration announcement trailer below. View a set of screenshots at the gallery.